There are certain quarters who find it difficult to ease themselves into playing a musical instrument, despite having a rigorous and disciplined schedule only to find that the original inner fire has just had its last embers blown out. The Five Key Keyboard, also known as Big Daddy, could dispel such feelings. 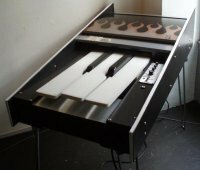 Created by Michael Robson who described as a “circuit bent keyboard”, this 27″ x 52″ x 41″ device won’t find any place in an orchestra but it is definitely a conversation starter where home decorative items are concerned. LOL! I would buy it.